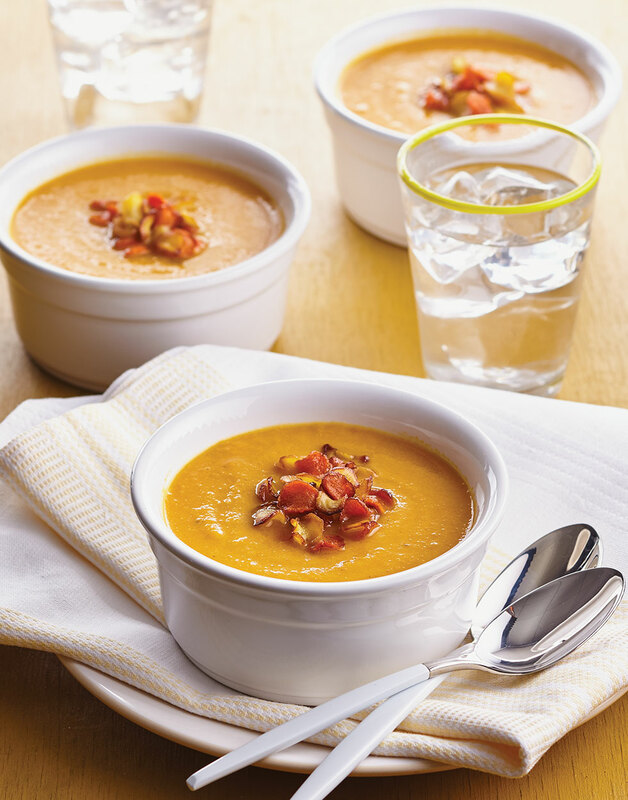 Beautifully colored, and packed full of nutrition, this puréed soup, topped with carrot and parsnip chips, tastes as good as it looks, plus you’ll feel virtuous when eating it. Pair it with this grilled cheese for a soup and sandwich combo that's out of this world. Root vegetable purées can sometimes get thicker than intended, so if your finished soup is thicker than desired, just add in a bit more broth. For the soup, toss carrots, parsnips, and onions with 6 tsp. (2 Tbsp.) oil, season with salt and pepper, and spread in a single layer on a baking sheet. Roast vegetables 20 minutes. Toss apple with remaining 1 tsp. oil, then stir into vegetables; roast another 20 minutes, stirring halfway through. Transfer roasted vegetables and apple to a pot. Add broth and bring to a boil over high heat. Reduce heat to medium-low and simmer soup 10 minutes. Off heat, purée soup with a handheld or standard blender. Season soup with salt and pepper. For the garnish, heat oil in a nonstick skillet over medium-high. Fry sliced carrots and parsnips until starting to brown and crisp; transfer to a paper-towel-lined plate and season with salt. Garnish servings of soup with carrot and parsnip chips. The vegetables take longer to cook than the apple. Partially roast them before adding the apple. Use a handheld blender to purée the soup, if you have one. It’s more convenient and is less messy. Drain the carrot and parsnip chips on a paper-towel-lined plate to ensure they stay crisp.